Title: THE CONVICT'S CHILD or The Helmet of Hope. 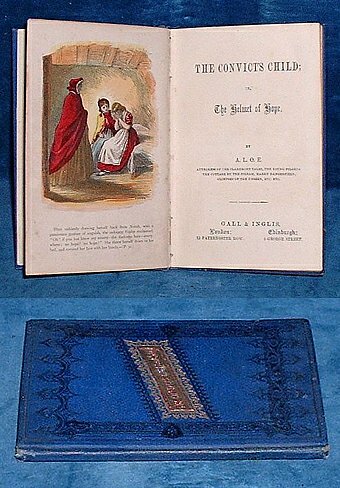 Description: London, Gall & Inglis 1874 not later than by inscription) Color frontispiece. . 140x90mm blue decorated cloth with fancy gilt cover panel with red lettering (tips rubbed/sl fraying to head and foot of spine) All Edges Gilt 60pp. Presentation inscription from East Fen Sunday School Christmas 1874 to George Baumber. Lacks rear fly leaf else neat and tight.